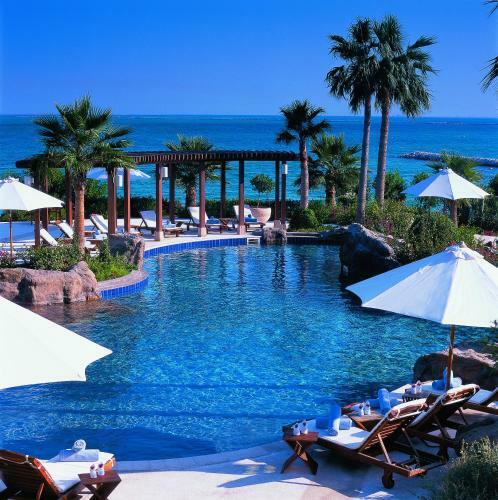 Lock in a great price for The Ritz-Carlton, Doha – rated 8.8 by recent guests! The attitude of the staff was excellent alongside the quality of rooms. The variety of food for breakfast is really good. Very private. Friendly staff members. Good location near many attractions. Hospitality and friendliness of staff, cleanliness of the place, responsiveness of everyone to do what u ask for, Rooms are much larger than any other Hotel and very luxurious with all amenities at your fingertips. Every thing were nice & perfect. Clean rooms & suits, comfortable beds, and the staff were very friendly. We really enjoyed our stay at Ritz Carlton Doha Hotel. It was our first time and for sure it will not be the last. If you want a relaxing time to spend with a perfect stay, for sure you have to stay in this hotel. I really recommend for couples, family, and friends. The Ritz-Carlton, Doha This rating is a reflection of how the property compares to the industry standard when it comes to price, facilities and services available. It's based on a self-evaluation by the property. Use this rating to help choose your stay! Nestled on the shores of the Arabian Sea, the Ritz-Carlton resort features a world-class spa, modern fitness center and elegant restaurants and bars. The property also features indoor and outdoor swimming pools and lush landscaped gardens. The Lagoon restaurant, with its open kitchen, features a varied all-day buffet dining, combining Continental, Arabic and Far Eastern flavors. Flamingo offers panoramic sea views by the pool and serves snacks and light meals. 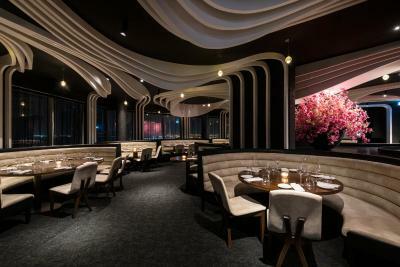 STK Doha, a steakhouse, is opening soon and will be located on the 23rd floor. Afternoon tea can be enjoyed in the Lobby Lounge while Habanos offer live entertainment, evening cocktails and cigars. The Ritz-Carlton is 10 minutes’ drive from the cultural center of Doha, Katara Cultural Village and its conveniently located across Lagoona Mall. This property also has one of the top-rated locations in Doha! Guests are happier about it compared to other properties in the area. 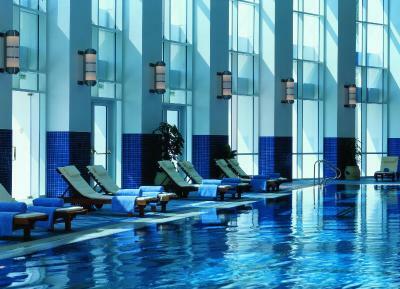 When would you like to stay at The Ritz-Carlton, Doha? The room features a private balcony overlooking the sea or city. It has elegant decor with hand-crafted furnishings from Italy and Spain, and a private bathroom with bathrobes and slippers. There is a choice of an extra large double or 2 single beds. 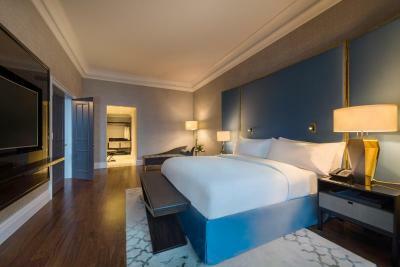 The spacious suite features elegant decor with velvet and silk wall coverings and an extra large double bed. It has a separate lounge with a satellite TV and a minibar. The suite includes a private bathroom with bathrobes and slippers, and a steam shower. 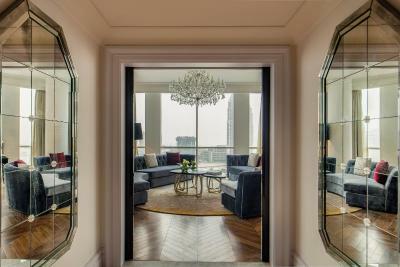 The spacious suite features a private balcony overlooking Doha’s West Bay Lagoon area and elegant decor. It has a separate lounge and a kitchenette. The suite includes a private bathroom with a hot tub and steam shower, and an extra guest bathroom. The very spacious suite features a private balcony overlooking Doha’s West Bay Lagoon area and elegant decor. It has a separate dining room, lounge, kitchenette, and study area. The suite includes a private bathroom with a hot tub and steam shower, and an extra guest bathroom. Hotel surroundings – This neighborhood is a great choice for travelers interested in relaxation, beaches and family-friendly trips – Check location Great location - show map Guests loved walking around the neighborhood! 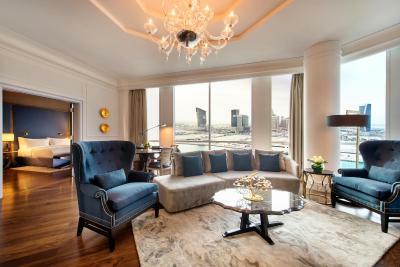 House Rules The Ritz-Carlton, Doha takes special requests – add in the next step! 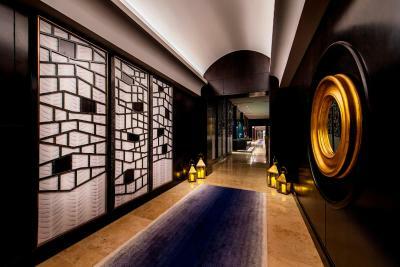 The Ritz-Carlton, Doha accepts these cards and reserves the right to temporarily hold an amount prior to arrival. Kindly note that the hotel will be going under partial renovations in the spa and rooms until further notice. There will be some minor noise disturbances. 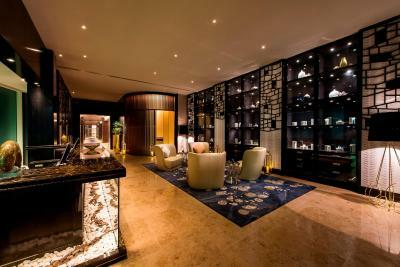 Please note that The Ritz-Carlton, Doha charges a small deposit for incidental charges that is refundable upon check-out. They Gave me a room with out a chair !! Stayed in the Club Room and had access to the club lounge which is definite value for money as everything is expensive in Doha. Food in the club lounge is amazing and lots of complimentary drinks. 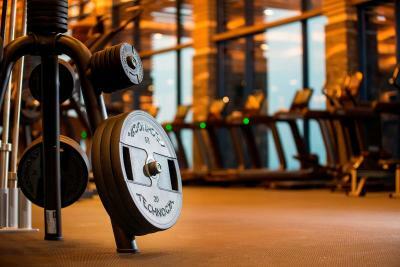 Hotel is great, Gym is amazing. Pool area is great but very busy at Easter. Case of putting your towel on the sunbed before breakfast at Easter! Location is Ok although no-one walks in Doha so its taxis everywhere. Property is a little old. Pools outside do not really compare to other top hotels. Staff are excellent. Restaurants very good. The steak house on 23rd floor is well worth a visit. The Executive lounge was absolutely super, the best we have stayed in and the staff really attentive. There is a dress code, of which we were made aware when we arrived. However, every evening another male guest would arrive, straight from the gym, wearing his sweaty gym clothes. It was unbelievable how anyone would think that’s acceptable. He was dripping with sweat and then proceeded to sit, drink and eat dinner on the beautiful fabric sofas. I really hoped the manager of the lounge would have a quiet word. The pool area is in desperate need of an upgrade, there is hardly any shade, very few umbrellas. We spent most of our time on the beach, much more peaceful, but only 5 umbrellas for the hotel guests??? Really not what you would expect from a Ritz hotel chain. Again, the staff on the beach were really helpful. The staff in the club lounge are absolutely amazing, could not do enough for us. Well done. The size of the outside swimming pool is so small and not compatible with the hotel occupancy. Staff and their efforts to satisfy the customers. I was very disappointed 1: as they close the outside pool @ sunset whereas all the neighbouring hotels go on until 8 pm. indoor pool was very crowded. 2: the dinner buffet was very normal.. it wasn’t a very interesting buffet. They had few things which was just okay. We were on a staycation for a night and these two things were very important for us as a family. The room and the staff only. Noisy. Lot of nightime noise from people playing music. Also a loud 'festival' took place in the grounds whilst we were there, which was loud music under our window until midnight. Club lounge was exceptional and well worth the money. Food was plentiful, delicious and fresh, you didnt need to eat anywhere else. Staff were brilliant. Free wine and spirits in club lounge. Spa was brilliant and staff so friendly and sweet. Very nice club lounge with mostly good food though the wines were only moderate. All staff friendly and helpful. Reception very good. Concierge staff good but not exceptional. Pool are very pleasant if sometimes too busy. During our stay there were some dining places to be opened soon, so for the next guests there will be more choices than we had. Beach next to the hotel was somehow very lonely and a bit boring, but pool area was nice and comfortable. 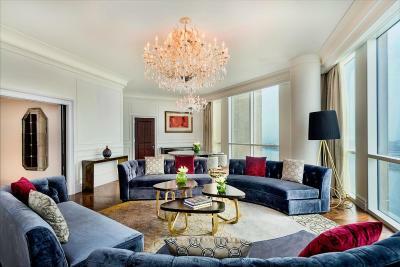 When choosing the hotel via Booking.com, I read that Ritz-Carlton hotel received a lot of excellent feedback regarding good service and high level of personnel and that was my first preference to choose. And I’m not disappointed in my choice at all – staying in Ritz-Carlton was very good experience and mainly because of friendly and helpful staff. Especially I would like to thank following persons: Customer experience manager Fion who personally found time to introduce us a hotel, prepared our room earlier than standard check-in time and offered complimentary breakfast – just excellent service! Room service by Reju – room was clean and always well prepared. Guest Experience Pavlina – she is very nice person and gave us good recommendations which places to visit in Doha and was helpful to answer to all our requests. Rooms Division Voyager Irene – she was helpful to print boarding passes and solve running issues we had. Also thanks to concierge who organised our safari trip – it was well organised by professional partner. I would like to thank you all for making our family to feel like we are really welcome in every moment, so I would highly recommend Ritz-Carlton hotel for stay in Doha.